The much-ballyhooed Tokyo debut of Oakland’s Blue Bottle Coffee Co. in February galvanized Kiyosumi-shirakawa’s reputation as the city’s coffee epicenter, turning the area into a magnet for caffeine-addled day-trippers. Taiju Hayashi certainly isn’t going to complain about the extra business he’s been enjoying at Arise Coffee Roasters, which sits on a street corner just meters away from the Californian import, but he confesses that he misses the days when a queue didn’t form outside his shop every weekend. “It’s a drag if the regulars can’t get in,” he says. To be fair, the hurdle for qualifying as a regular here is pretty low. Hayashi treats first-time visitors with a mixture of warmth and good-natured curiosity that’s instantly disarming. The few seats inside the shop — a bench and a couple of armchairs — form a semicircle facing the counter, which is perfect for striking up conversations with other customers. By the second time I went, I already felt like I was part of the gang. 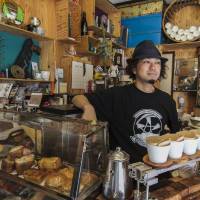 Though Arise opened in 2013, Hayashi is a veteran of the specialty coffee circuit. He spent a decade — “10 years and one month,” he says, to be precise — working at the Tokyo-based commercial roaster Yamashita Coffee, where his clients included luxury chocolatier Pierre Marcolini. That experience led to an offer for Hayashi to oversee The Cream of the Crop, a new roastery run by the same company as Marcolini’s Japan operation, when it opened in Kiyosumi-shirakawa in 2012. The position was hard to resist: It was the first time he’d had a job that was within skateboarding distance from home. Hayashi says he hadn’t even considered opening his own place until he worked at Cream of the Crop, and discovered that he had a talent for hospitality. It helped that he’d lived in the area for over a decade at that point — when customers asked for local recommendations, he was happy to oblige. In setting up a shop of his own, though, he says his model wasn’t Oakland, but Okinawa. He flips open a magazine and shows the kind of place he’s talking about: a simple counter with a few benches, something you might find in the middle of an outdoor market. Arise Coffee Roasters is slightly more sophisticated than that — there’s a roof, for starters — but it’s just as approachable. 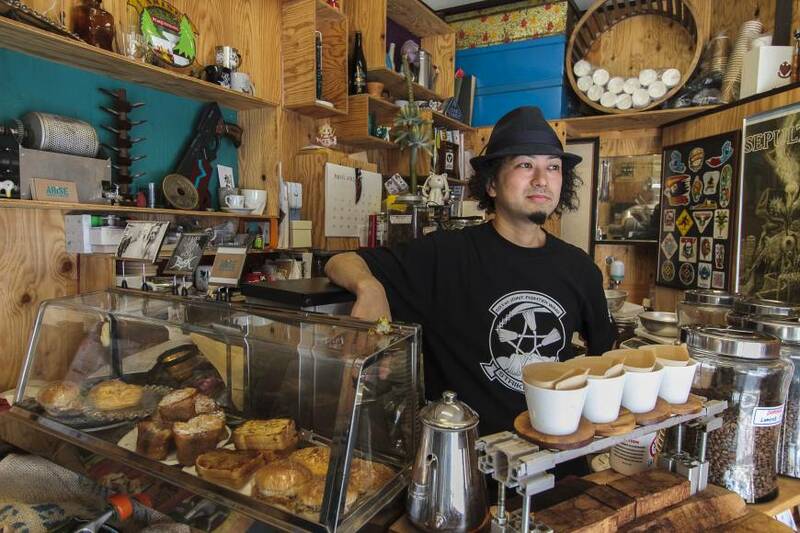 There’s a refreshing lack of fuss in the way Hayashi prepares cups of drip coffee, or steers customers toward the ideal bean. “What’s the one that tastes like lemon tea?” asks a repeat visitor. “Ethiopian!” he says, beaming.